To become an engaged employee, you first need to have the basic elements of job satisfaction. These include pay, benefits, tools and resources, and a safe working environment. Every variation of the MAGIC keys need not be present in order for you to engage. Let’s look at autonomy, for example. In our roles as consultants working with our partners on engagement initiatives, we spend a good deal of time on site in their facilities, our spatial and temporal autonomy is restricted. We have some degree of control, but that’s limited by client needs. Are we disengaged? Not at all. We have a great deal of task autonomy, as well as social autonomy. While it’s important for each MAGIC key to be present in order for you to engage, these keys can be present in different ways. For most people, different MAGIC keys carry different weight. For you, connection may be critical; for others, the idea of social connection is actually disengaging (introverted much?). The socially reticent person may still find organizational connection to be important. What engages you will not necessarily engage another person. Company engagement initiatives that try to impose engagement on employees are doomed for the simple reason that while a corporate plan to have employees volunteer at local homeless shelters may resonate with some employees, it won’t resonate with all of them. With engagement, frequency and intensity matter. Do you find meaning in what you do every day or only on occasion? Is the work you do deeply meaningful to the degree to which it feels like your life’s mission, or is it something you merely feel is important until something better comes along? The greater the frequency and intensity with which you experience the MAGIC keys, the greater your level of engagement will be. 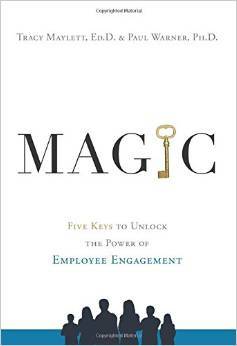 The point is to leverage the five keys of employee engagement in a personal way that makes sense for you. If you find that one key is lacking, either try to improve it or look for strength in the other keys to fulfill your need to be engaged. This originally appeared on the Engagement Magic blog.